Capicola: Capicola or Capocollo (in America, capicollo or capicolla), or coppa, is a traditional Italian cold cut (salume) made from dry-cured whole pork shoulder or neck. 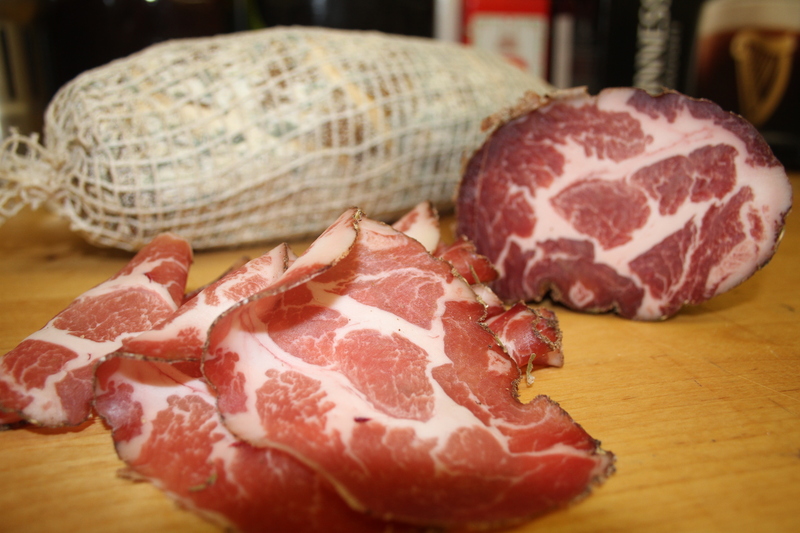 The name coppa is Italian for nape, while capocollo comes from capo—head—and collo—neck—of a pig. Mix all the salt and spices in a bowl. Rub the pork shoulderwoth the spice mix and completely cover it. Seal the meat in a big zip lock bag with the left over spices into the bag. Put the bag of meat and spices into the fridge. Let it sit there to cure for about 3 weeks. It should be nice and stiff when you take it out. Take the meat out of the bag and rinse off the spices in the sink with tap water. Add bacteria culture to water in a bowl. Let the pork shoulder sit for a few minutes in the bacteria culture. Take your recently rinsed meat and completely cover it in this bacteria water. This bacteria is safe to eat and will ensure no harmful bacteria grows. Wrap the meat in cloth, wrap string around the cloth to keep it tight in position. Hang up the meat at 14°C or cooler for about 7-10 days. After 7-10 days take the meat down and put it into a plastic bag in the fridge. Here it will develop delicious flavors over the next few months. Leave it in the fridge for 3-6 months. It will stink like dirty feet when you take it out, don’t be alarmed it will taste fantastic! Unwrap the Capicolaand thinly slice. Capicola is ready to be served with good quality wine.